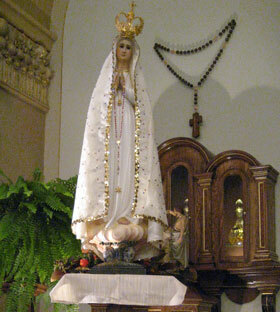 The travelling statue of Our Lady of Fatima is here in Jefferson City, MO. It arrived at Immaculate Conception Church this afternoon and will be there until tomorrow when it moves on to Our Lady of Lourdes in Columbia, MO. My wife and I were able to stop for a visit for a little while this afternoon. Kneeling in front of Our Lady really helps bring a sense of peace in this crazy world. If you ever have a chance to see the statue please take the time to offer some prayers for her intercession.